Inbound marketing is a huge buzzword these days. But how can you use video as part of the inbound methodology? In this blog post, we will give examples on how you can use video in all four stages of the inbound methodology. 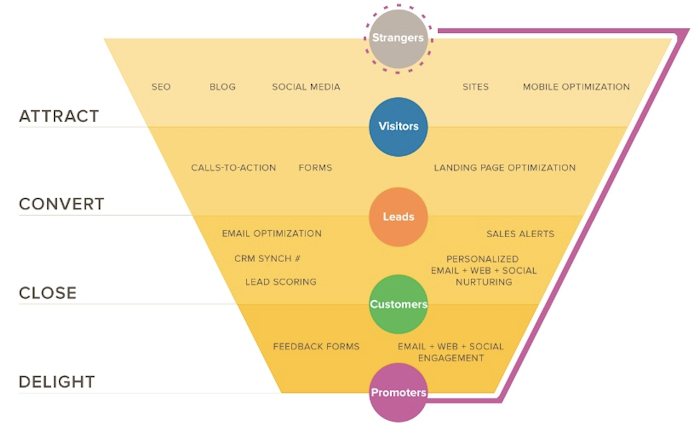 The funnel consists of four stages: attract, convert, close and delight, where the goal is to turn strangers from visitors, to leads, to customers and eventually to promoters of your business. To do this, they typically go through each stage of the sales funnel, and as an inbound marketer it’s your job to nurture them through all the stages. Download our free ebook “The Ultimate Guide To Video Marketing Strategy 2018”. In the attract stage, you want to catch the attention of your potential customers and lead them to your website. Here, you should provide content that gives them valuable information that can help solve their problems. In this stage, videos are perfect. Think of it this way: your potential customers might not be quite ready to dedicate a lot of time reading your ebook, but they might be ready to watch a video about that same topic because it requires much less time and effort. An example of a type of video you can create in this stage is longer in depth interviews on topics that are relevant to your potential customers. 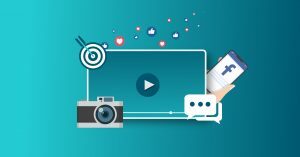 Publish shorter teasers on social media, and add a call to action that leads your audience to your website where the longer version of the video lives. When you have gotten the attention of your visitors, it’s time to try and convert them into leads. At this point, you want them to give you their email address. You can do this by creating conversion points on your website that are designed to capture emails. Put a form in close relation to the video they have just watched, or use a tool like Twentythree. Ask the viewers to leave their email address if they would like to receive more similar content to their inbox. In the close stage, you want to turn your leads into customers. When anonymous strangers have watched your video content and willingly left their email address to learn more, they’ve turned into leads. A good idea is to send these leads more content regularly to prime them into becoming customers. Studies show that by incorporating video in your email campaigns, you can increase the click-through rate by 96%. Make sure you put the word “video” in your subject line. You’ve managed to land the deal – GREAT! Just because you’ve closed a sale and landed a new customer doesn’t mean you should stop sending them relevant content. An important part of the inbound strategy is to keep your customers “delighted”. A great way to do that is by keep sending them helpful videos that provides value, like demonstration videos if you’ve released a new product or feature. Want to learn more about how you can incorporate videos in your overall marketing strategy in 2018? Get your free copy of “The Ultimate Guide to Video Marketing Strategy” by clicking the link below. Newer Post 12 Ultimate Tools I Use As a Traffic Manager At VIBBIO	Older Post How to avoid failing with your Facebook video ads?